My friend Sharyn from Simply Homemade made a zillion cupcakes for Breast Cancer Awareness Month. Partial proceeds go to the Susan G. Komen Foundation for breast cancer research. October is pink ribbon month! National Breast Cancer Awareness Month. Yes, a good reminder for women to have their yearly mammograms! Do it, don't put it off! 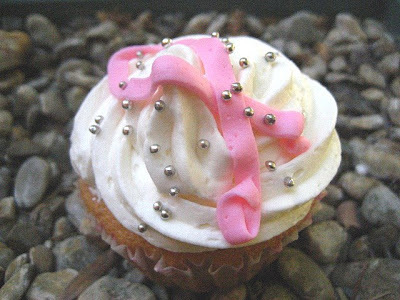 The cupcakes have delicious butter cream frosting with vanilla cake, pink icing ribbons and silver dragee. They are all packaged in pretty pink or white boxes. Please get them out of my house. I had 2 for lunch today! 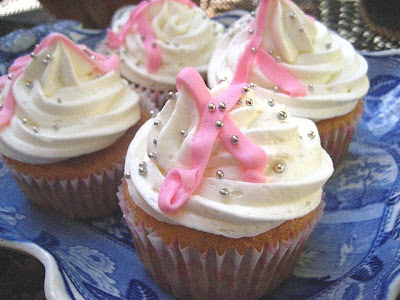 If you are in New Jersey and would like information about the cupcakes or breast cancer awareness month, please contact me via my blog. Or, if you want to stop by and have coffee and a cupcake, you are always welcome! I have personally had the pleasure, during one of my rare trips east from my home in Arizona, of gobbling up at least two of Sharyn's cupcakes. All I can say is wow. I wish we had her here - it would certainly ratchet up the bar of phenomenal bakery goods. Congratulations to Sharyn for her magnificent product. Those are beautiful Stacey, especially the importance and meaning behind them. Hugs!!! So pretty! I cannot ever find those silver beads for baking...where did you get them? ADORABLE! I've got to round me up some of those silver balls, they are just too cute.